Halloween sewing is hands down my absolute favorite! This year for Halloween, I got to pick Em's costume. I was hoping to do coordinating costumes for my kids, but when A decided he wanted to be Superman I decided to scratch that idea, I just couldn't get excited about a Lois Lane costume for her. And since she doesn't really have an opinion on her costume yet the decision was left to me! 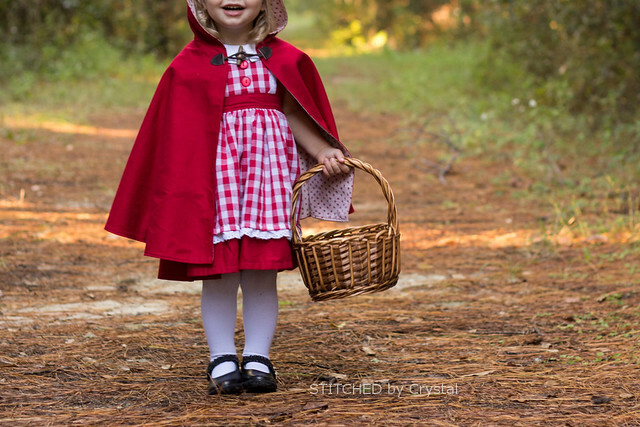 I decided on Little Red Riding Hood for her, partly because I was Little Red Riding Hood once when I was little and it was one of my most favorite costumes, but mostly I picked it because I thought she would make the cutest Little Red! 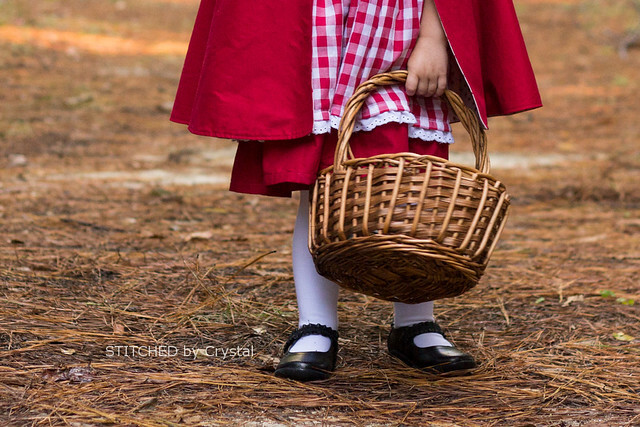 For her costume, I made her THIS gingham dress. 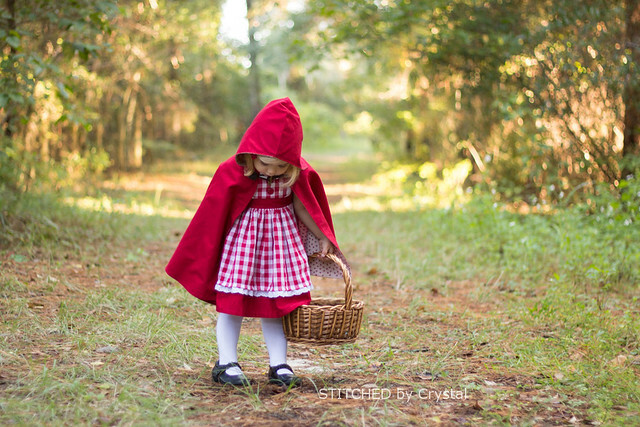 I felt like a Little Red Riding Hood costume gave me the freedom to make any dress I wanted really, there are so many different variations of Little red, ones that wear red dresses, ones that wear black corsets, ones that wear grey dresses...So really she just needs a dress and a red hooded cape. 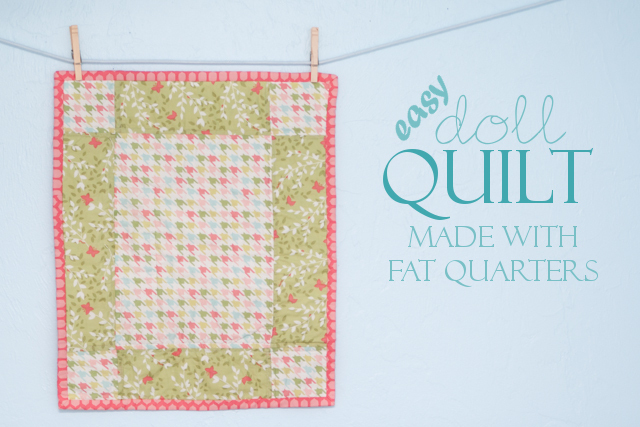 I chose to do a gingham with some eyelet trim and I love love how it turned out. Then I made her cape. It is red (of course) on the outside and I lined with a vintage looking fabric that is cream colored with little red flowers. And finished it off with a little toggle to keep it on. More details on how I made the cape are at the end of this post! 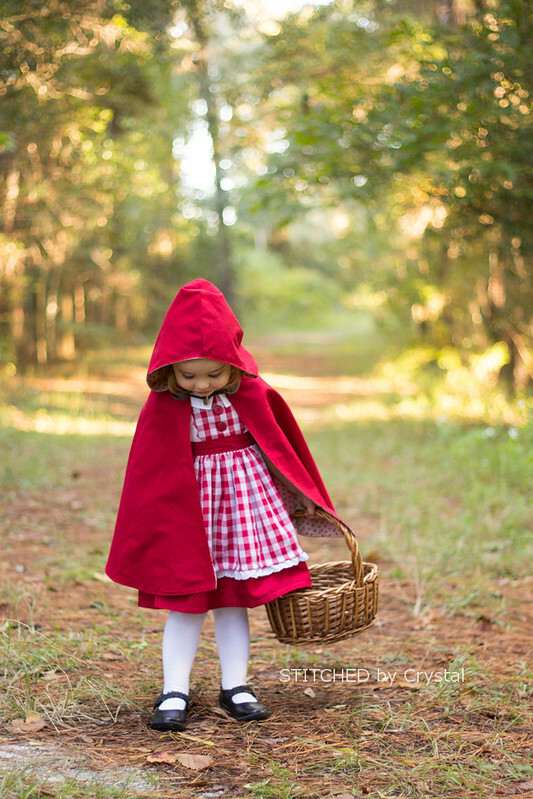 And to finish off her costume, I picked up a basket at Hobby Lobby for Little Red to carry all her goodies for Granny (or her candy for trick-or-treating). 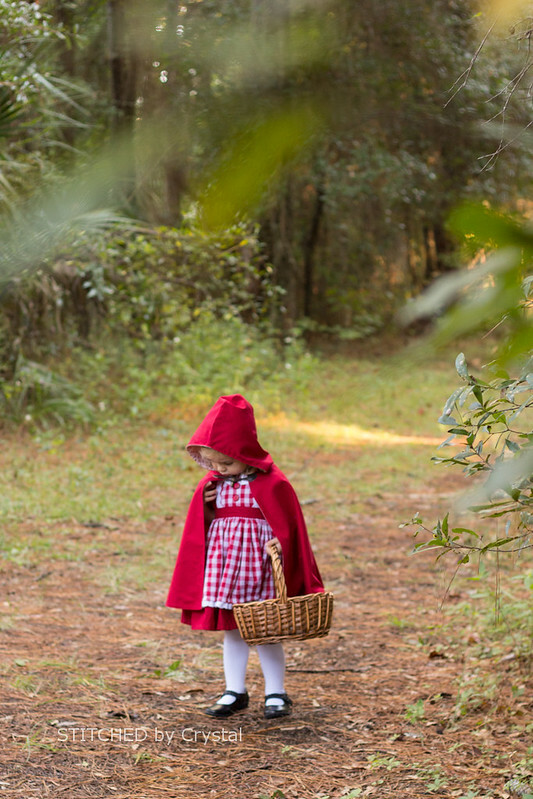 And Little Red Riding Hood is ready to head off into the forest alone to take some goodies to her poor sick Granny....OK wait, who sends their kid off into a forest alone where she could get eaten by a wolf?! 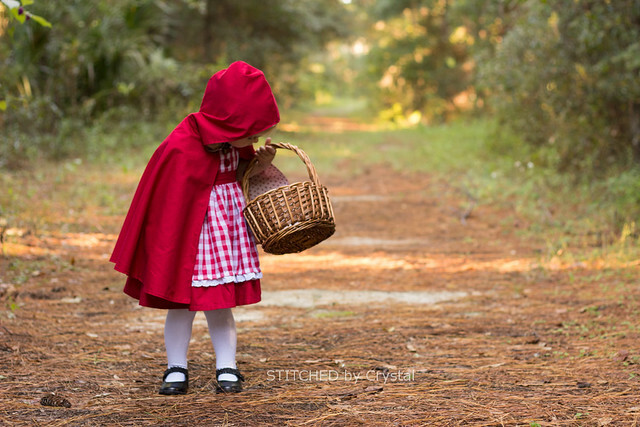 I think we will be sticking to supervised trick-or-treating in a wolf free zone:) Although, A has informed me that I shoud dress at the wicked wolf, and he says that I have to wear a costume if I want to go trick-or-treating with him...we'll see. 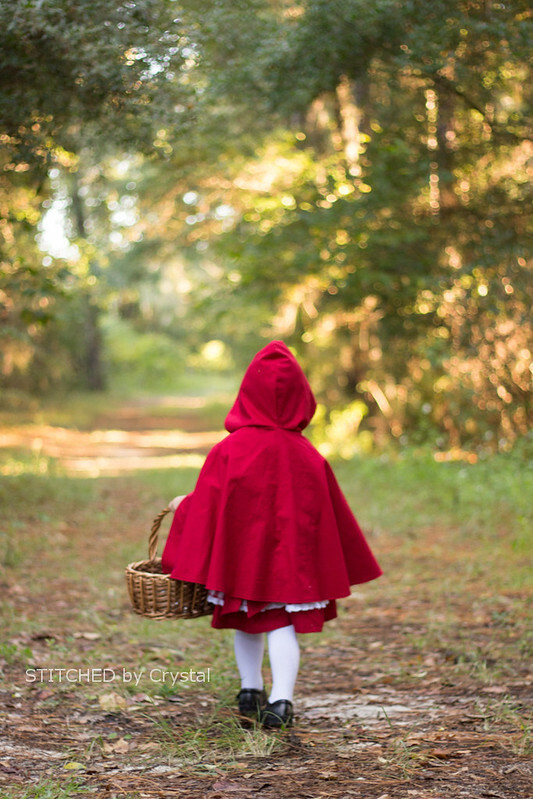 Alright, one more photo of my adorable Little Red and I will get on to the cape tutorial! 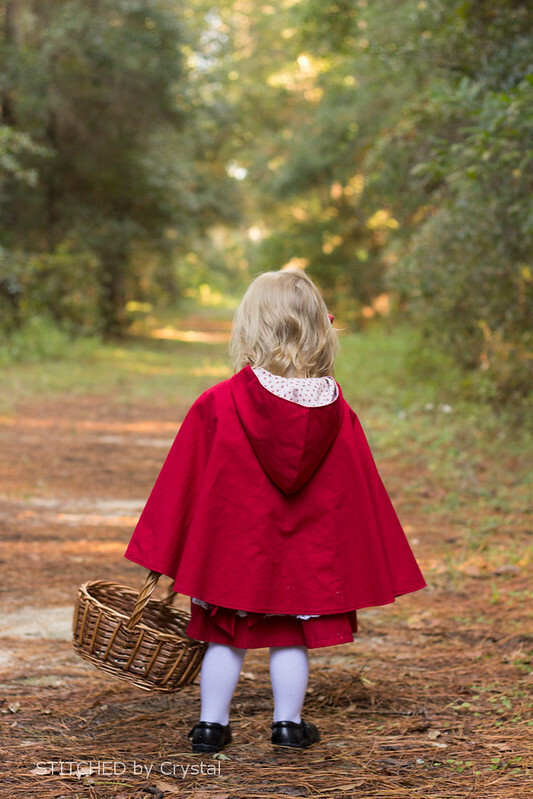 Want to make a hooded cape? Here is how I made mine! Something to fasten the cape, I used a toggle, but you could use something like a ribbon to tie or a button and fabric or elastic loop. The cape is made from a big half circle. 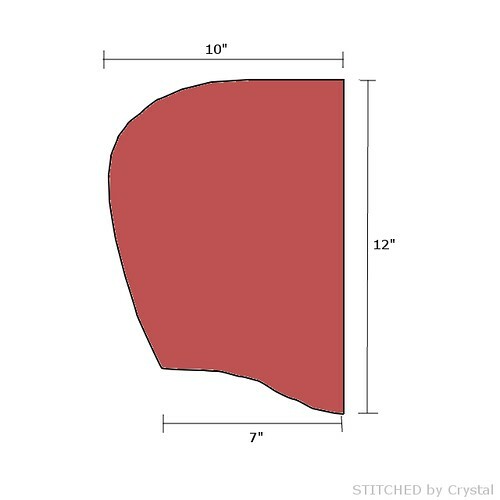 Determine the what the finished length you want your cape and then add 1", for my daughter the finished cape is 16" so I cut my cape 17" long. 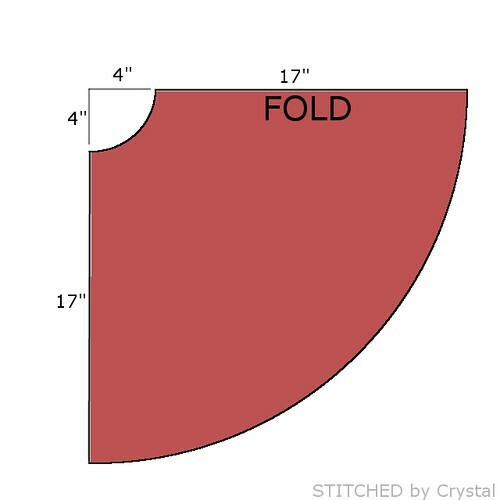 Fold your fabric in half, then cut a quarter circle on the fold (when you unfold it it will be a half circle). Cut a quarter circle with a radius of 4" at the top, then cut a second circle measuring the finished length +1" from the first circle as shown in the photo below. 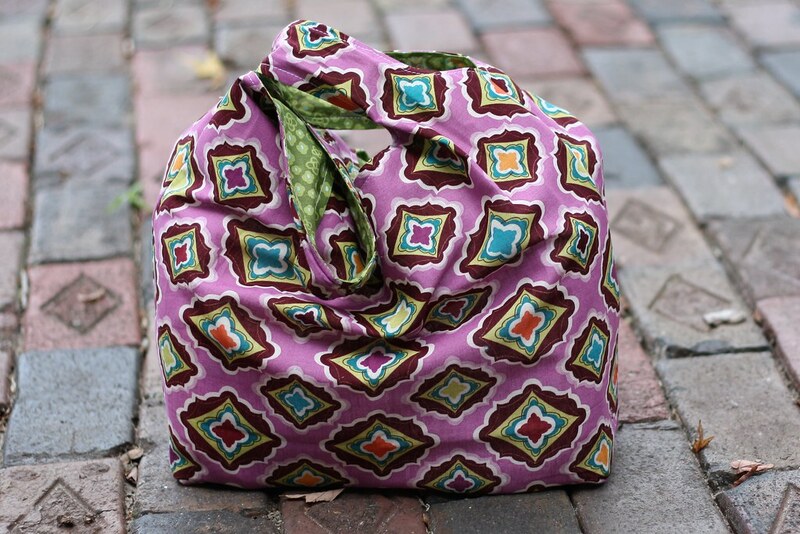 You will need one of these in your outer fabric and one in your lining. The 4" radius at the top should work for most small kids, for bigger kids or adults, you may want to go up to 5". To cut the hood, I drew out a hood shape that was roughly 10" wide and 12" tall. You can see the shape I cut below. 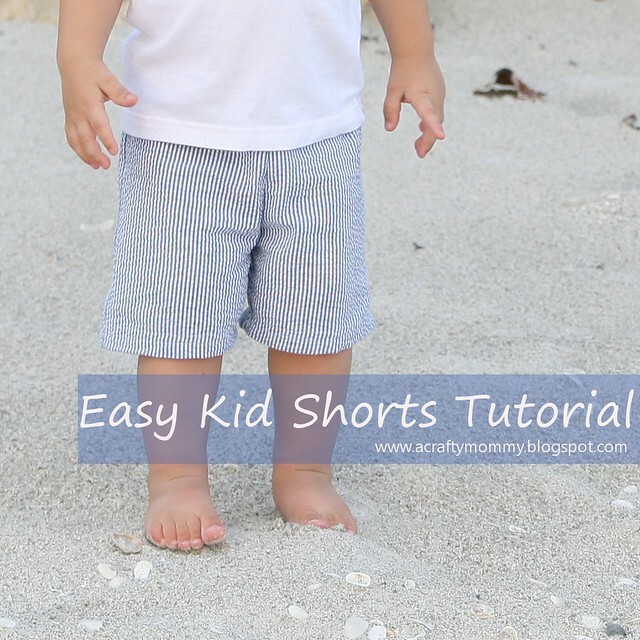 Again, this size works for my 2 year old, you will want to adjust for bigger sizes. 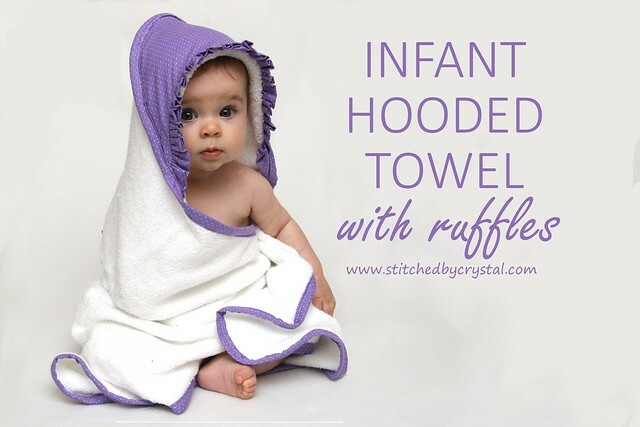 An easy way to get a good hood size and shape is to trace a hood off of one of your kids sweatshirts that fit well, simply lay the hood flat and draw around it. 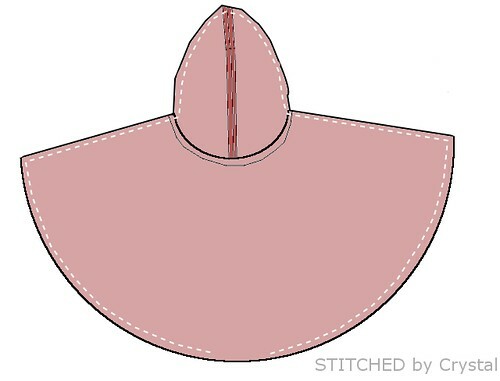 You will need 2 hood pieces for the outer cape and 2 hood pieces for the lining. 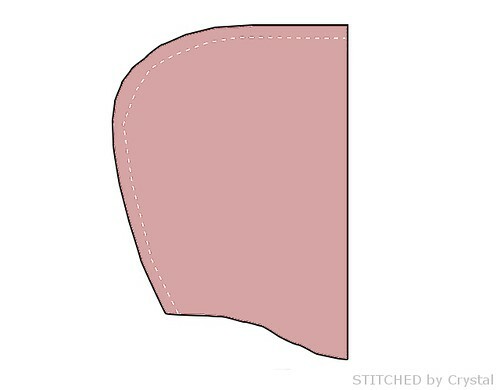 Sew your hood pieces right sides together as shown below. Repeat with the lining hood pieces. 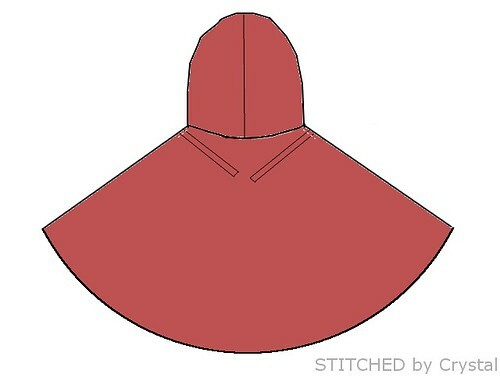 Open your hood and pin the bottom of the hood to the neck hole of the cape with the right sides of the hood and cape together. Sew the hood to the cape, repeat with the lining. 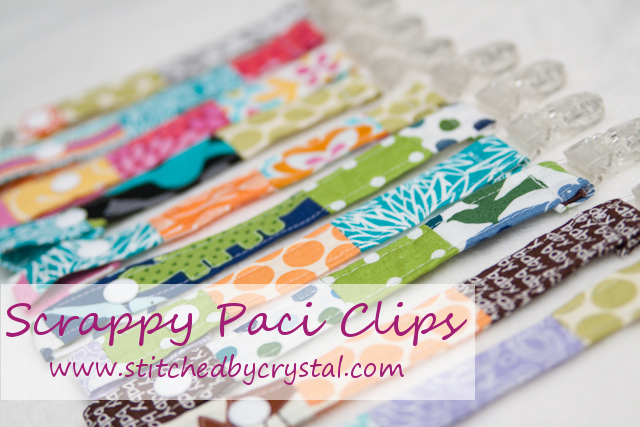 If you are using ribbon or a button loop as your closure, baste them in place now. Baste them to the right side of the cape lined up with the raw edge of the cape, close to the hood. 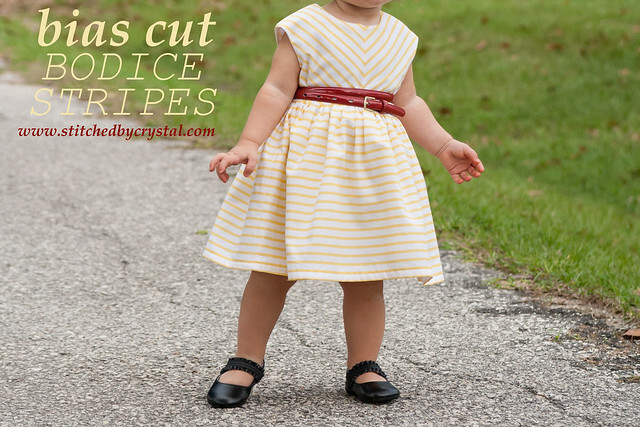 Place your cape and the lining right sides together and sew all the way around the edge, leave a 3" opening at the bottom of the cape. Turn the cape through the hole left in the bottom. 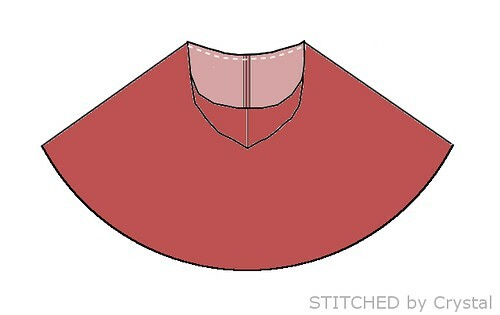 Press the cape, then topstitch around the edge of the cape and hood, making sure you close up the hole at the bottom. 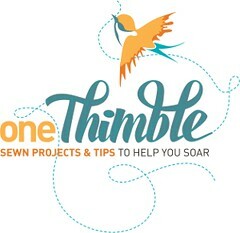 If you are using a toggle, sew it in place now. And your cape is done! Easy right?! 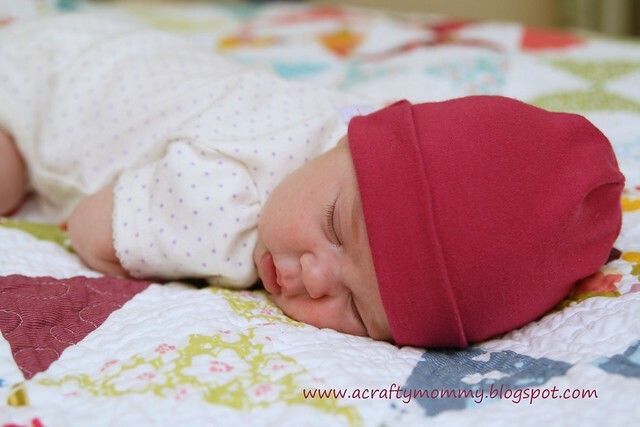 What type of red fabric did you use for this project? This is adorable. Thanks for sharing, this is just what I was looking for. Thank you! 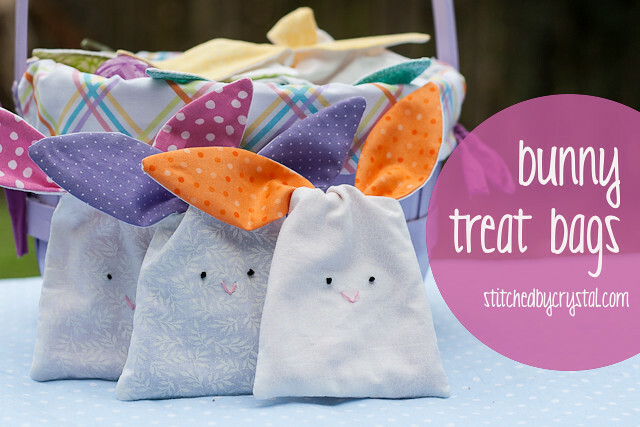 quick and easy to make - makes one happy mummy and one happy 3 year old! 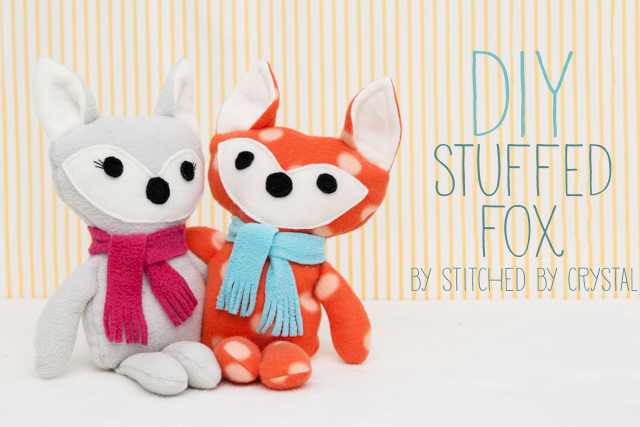 This is so cute - thank you for sharing your tutorial. I've just made one for my toddler for a traditional dress up event called Carnival in Germany. I opted for a button and ribbon closure and as the lining I had was so pretty I made it reversible. Just whipped this up for world book day for my 3 year old, fabulous tutorial, thank you! Thank you so much! This is just what I needed. I made one as a gift, it came out great! 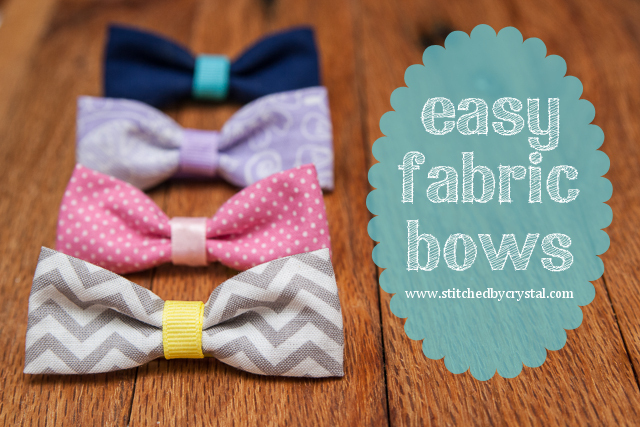 I'm new at sewing :) Now I'm going to make one for my son too. This is SO cute! Great tutorial, easy to understand instructions. Thank you! Thanks so much for the great turorial!!! I made this smaller for my 9 month old in velvet and its adorable!!! I am interested in what type of red fabric was used for this. It hangs so nicely. Thanks for the tutorial!